If you are trying to trade the usd to cad pair at the moment, then more patience is required I’m afraid, as we wait for the breakout, which could come today as we have two sets of fundamental news, which will bring volatility to both currencies. First in Canada we have the Employment and Unemployment changes, followed later in the US with the Non Farm Payroll numbers. Yesterday was another narrow spread day with an up bar, but with increasing congestion in the moving averages, there is no clear direction, other than sideways. 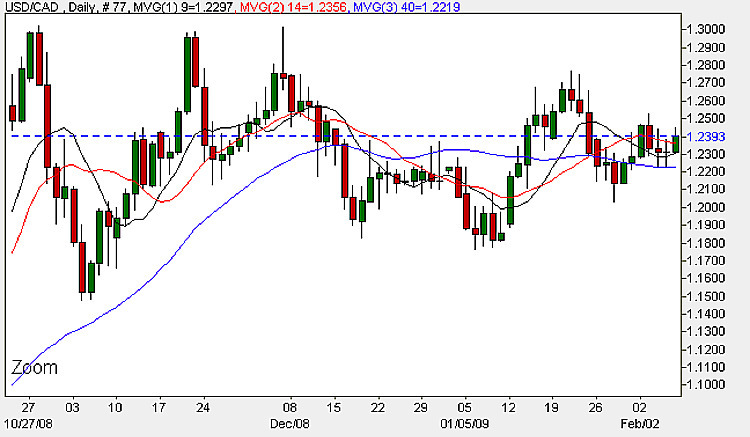 The short term pennant pattern is forming nicely on the daily chart, with the point somewhere around1.2300 – 1.2400. Today could bring a breakout with volatility, so I would suggest staying out of any long term positions, and only trade if you are proposing to trade through the news. At 1.00 pm ( UK Time) we get two pieces of news at the same time in Canada, the first of which is the Employment Change, and the second is the Unemployment Rate. The first is the change in the number of employed people during the previous month, and is a leading indicator of the economic health of the country, and generally has a significant impact on the currency as it provides an early signal to changes in the labour market. If the actual is better then forecast then this is generally considered good news for the home currency, in this case the Canadian dollar, with a forecast of -40,000 against -20,000 last time. As always it is the markets expectations that are important – the news will be bad, but it is a question of how bad. The second set is the opposite, and covers the percentage of the total work force that is unemployed and actively seeking employment during the previous month. The forecast is 6.8% against a previous of 6.6%. In this case if the actual is less than forecast then this is good for the currency. It is generally viewed as a lagging indicator. I have covered the Non Farm Payroll figures elsewhere on the euro to dollar site. Hopefully after today we may have some confirmed direction for next week, should we see a significant move later today. Have a great weekend and good luck with your trading.